This is a very broad overview of terms I use on the Ranch. I will add more as I think of them. Balling gun – a tool used to discharge pills into the animal’s throat. Birth weight EPD – The expected average increase of decrease in birth weight of a bull’s calves when compared with other bulls in the same sire summary. Bloat – abnormal conditions characterized by a distention of the rumen, usually seen on the left side, due to the accumulation of gas. Bloom – a haircoat that has luster that gives the appearance of a healthy animal. Bolus – a large pill for treating cattle; you use a balling gun to administer. Bos indicus – zebu (humped) cattle, including the Brahman breed. They tolerate heat and insects well. Bos Taurus – European breads that tolerate the cold, such as Hereford, angus. Brand – a permanent identification of cattle usually made on the hide with a hot iron or freeze brand. Bred – a cow that has mated with a bull and is pregnant. Brucellosis – a contagious bacterial disease that results in abortions; also can be called bang’s disease. Bull – a male bovine, usually of breeding age. Bulling – when a cow is in heat or estrus. Calf – a young male or female bovine under 1 year of age. Calve – to give birth. Cod – scrotal area of a steer remaining after castration. Colostrum – the first milk given by a female cow following the delivery of a calf. It is high in antibodies that protect the calf from invading microorganisms. Conditioning – Treatment of cattle by vaccination and other means prior to putting them in a feedlot. Cow/calf operation – a segment of the cattle industry that manages and produces weaned calves. Crossbred – animal produced by crossing two different breeds, for example a Brahman and Angus is a Brangus. Cud – bolus of feed that cattle regurgitate. Cull – to eliminate one or more animals from your herd. Dewlap – the flap of loose skin under the chin and neck of cattle. Direct sales – selling cattle directly to one ranch to another, from ranch to feedlot, or ranch to packer. Dressed beef – carcasses from cattle. Ear mark – a method of permanent identification by which slits or notches are placed in the ear. Ear tag – a method of identification by which a numbered, lettered, or colored tag is placed in the ear, like an earring. EPD – expected progeny difference, one-half of the breeding value in the sire or dam. The difference in expected performance of future progeny of a sire, when compared with that expected from future progeny of bulls in the same sire summary. Embryo transfer – transfer of fertilized egg(s) from donor female to one or more recipient females. Eviscerate – the removal of internal organs during the slaughter process. Feed bunk – trough or container used to feed cattle. Feeder – Cattle that need further feeding prior to slaughter or a producer that feeds cattle. Feedlot – a segment of the industry in which cattle are fed grain and other concentrates for usually 90-120 days then slaughtered. Finish – Degree of fatness of an animal or the completion of the last feeding phase of slaughter cattle. Finished cattle – Fed cattle ready for slaughter. Freemartin – female born twin to a bull (usually these heifers will never conceive). Grass tetany – Disease of cattle marked by staggering, convulsions, coma, and death that is caused by a mineral imbalance (magnesium) while grazing lush pasture. Heifer – a young cow, one that has never had a calf. Hot carcass weight – the weight of the carcass just prior to chilling. Ionphore – antibiotic the enhances feed efficiency by changing microbial fermentation in the rumen. Liver flukes – parasitic flatworm in the liver. Marbling – flecks of intramuscular fat distributed in muscle tissue. Mastitis – inflammation of the udder. Natural beef- beef that has not been fed growth stimulates or antibiotics. Pasture rotation – the rotation of animals from one pasture or field to another so that a field or pasture have no livestock grazing on them during a certain period of time. Pay weight – the actual weight for which payment of the cattle is made. Usually the actual weight minus the shrink. Preconditioning – preparations of feeder calves for selling and shipping, can include vaccinations, castration, training the calves to eat from a feeder or drink from a trough. Primal cuts – the wholesale cuts of beef. It can include: round, loin, flank, rib, chuck, brisket, plate and shank. Quality Grades – grades used in the beef industry to rate the beef; for example – prime, choice, select. Replacement heifers – heifers, usually between the ages of 10 – 16 months, that are kept to replace old cows in the breeding program. Ruminant – a mammal whose stomach has four parts – rumen, reticulum, omasum, and abomasum Cattle, sheep, goats, and elk are some examples. Scours – profuse, watery diarrhea from the intestines. 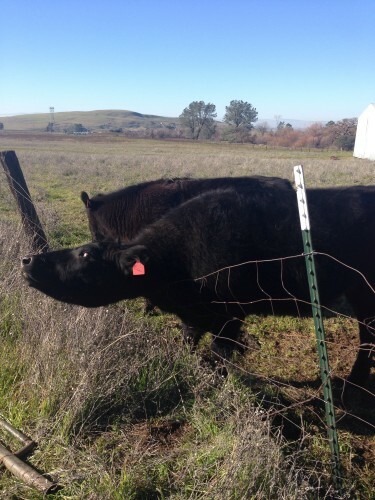 Seedstock – breeding animals like bulls. Used interchangeably with purebred. Shrink – loss of weight. Usually expressed in percentage of liveweight to account for fill (food and water). It is usually around 3 to 4%. Subcutaneous – an injection below the skin of an animal. Tagging- when we place tags in the ears of the cattle for identification purposes. Vaccination – when we administer a vaccine or shot. Weaner – a calf that has been weaned or is near weaning age. Weaning weight – the weight of the calf when it is removed from the cow. White muscle disease – muscular disease caused by a deficiency of selenium or vitamin E.
Yearling – animals that are one year old.